The idea came from his personal experience. Rupert Sellers started his career in the luxury hotel industry about 15 years earlier and specialized in recruitment for this sector. Working closely with clients and candidates it became clear that the problem could be solved much more efficiently than with the use of existing recruitment methods - i.e. job boards, LinkedIn and agencies. All of these channels have flaws. Job boards and aggregator sites may appear cheap, but their focus is on quantity, not quality. It's very easy to distribute a job advertisement, but typically 90 percent of applicant CVs that land in a recruiter’s mailbox are unsuitable. Trying to acquire talent this way is a waste of time and is not cost-effective. Furthermore, companies have to be ruthless in eliminating candidates which can result in hidden gems being missed. But perhaps the biggest problem with job boards is that the best candidates don't apply for the advertised jobs. This passive talent is usually the most sought after - They are open to new job opportunities but need to be approached directly. Barometa’s goal is to change that. 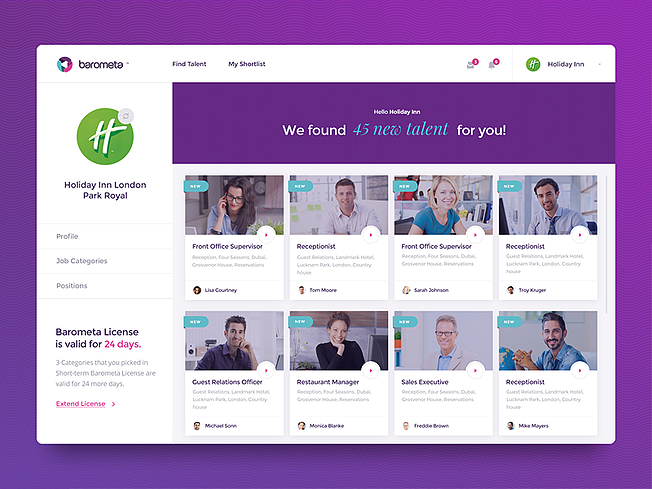 It is a recruitment platform that is carefully curated by experienced recruiters, and adjusted to the specific needs of the hospitality industry. The Barometa team assess and categorises every candidate by hotel type and job type to ensure the best matches for our range of clients. Ranking of talent is constantly updated on the system from aggregate ratings and comments on candidates generated by the client users. They are able to standardise and optimise the recruitment process for hospitality, making it fast, accurate and cost effective. Candidates sign-up to Barometa, but unlike LinkedIn, the Barometa platform includes only curated listings which are not made publicly available. Every candidate records a video and is pre-screened and categorized by Barometa to ensure accurate matching. The video profile is kept very simple and is tailored to the hospitality sector. Profiles can only be accessed and viewed by registered employers that are suited to the candidate’s experience and career plan. 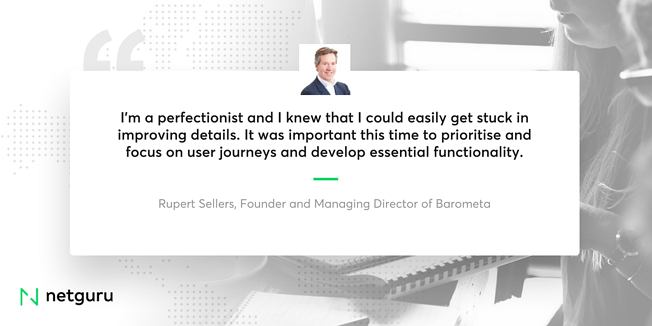 Barometa saves candidates’ time and provides a better user experience. Instead of having to record multiple videos for different job applications, they simply record one standardized video via the platform, answering a few questions that employers will be interested in listening to. These enriched profiles provide valuable insight for an employer. In hospitality, intangible soft skills - warmth, personality, smile, language - are often more important than a degree or even experience. Rupert Sellers needed an advanced and impressive prototype he could use when contacting potential investors. He didn't want to put much money into the idea. In looking for a technology partner, he chose Netguru which faced the challenge to get things done in just two weeks. There are several challenges in the hospitality recruitment market that available platforms (LinkedIn and job boards) fail to solve. LinkedIn provides a platform for active and passive candidates, in that their LinkedIn profiles (like a CV) are publically available for recruiters to view. The problem with LinkedIn is that recruiters struggle to identify relevant talent. Keyword searches generate poor matches, often because users (candidates) exaggerate and add keywords that do not apply to their skills and experience. Active job seekers, who might lack job stability, tend to spend much more time on optimizing their CV and LinkedIn profiles, compared to people who are not actively looking. Passive candidates are more likely to be high achievers, focused on their work – and in many cases haven’t added searchable keywords in their profile. Solving the inefficiencies of online job boards and LinkedIn. Adjusting the project to a limited budget. Meeting the 14-day deadline to create the prototype. In-depth understanding of the founder's vision was the key to working efficiently. Using an advanced prototype before developing the actual software made the project much more flexible, and was very useful in meetings with potential investors. Creating the right graphic design was a time consuming process, where communication and critical feedback from Netguru designers proved to be very useful. Weekly calls, Slack interactions, and prototyping using InVision made everything very smooth. As a total, Netguru proved to be a very knowledgeable UX design agency. However, probably the prototype created would not be as good if Netguru hadn't arranged face-to-face meetings with Barometa's founder in those key moments of the project every time it reached a milestone. The project was finished three days behind schedule, however, potential investors can now see how the platform works. The prototype is fresh, clean and different from competitor platforms. Barometa shows much more relevant information in the thumbnails of each candidate than LinkedIn. This saves time and is more convenient for employers. Netguru has helped Barometa's founder in meetings with investors. Also having an elite development team working on the project proved to be very helpful in negotiations. The next step is to build the MVP and start driving revenue.